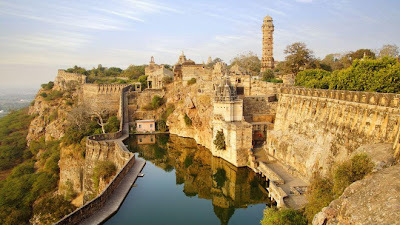 * Chittorgarh Fort is the largest fort in India and Rajasthan. * Chittorgarh Fort was build by the Mauryans during the 7th century AD and hence derives its name after the Mauryan ruler, Chitrangada Mori, as inscribed on coins of the period. * The fort was sacked three times between the 15th and 16th centuries, Following these defeats, Jauhar was committed thrice by more than 13,000 ladies and children of the Rajput heroes who laid their lives in battles at Chittorgarh Fort, first led by Rani Padmini wife of Rana Rattan Singh who was killed in the battle in 1303, and later by Rani Karnavati in 1537 AD. * Vijay Stambha (Tower of Victory) or Jaya Stambha, called the symbol of Chittor and a particularly bold expression of triumph, was erected by Rana Kumbha between 1458 and 1468 to commemorate his victory over Mahmud Shah I Khalji, the Sultan of Malwa, in 1440.